The Third Edge of the Sword: Alberta Election Thoughts Part One: Separated at Birth? Alberta Election Thoughts Part One: Separated at Birth? 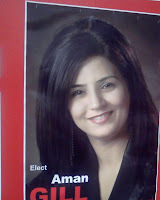 On the left, a photo I took of an election sign for Aman Gill (Pakistani), who failed to beat Gene Zwodezsky (or however its spelled) in Edmonton-Mill Creek. On the right, a photo of cute-as-a-button Conservative MP Rona Ambrose (German). Seriously, did nobody else notice this? Update, March 10 2008 9:56pm: An anonymous reader notes that Gill is from India, not Pakistan. Not that it matters much, one whim of a British bureaucrat or one launch of a nuclear weapon by those wackos over there and she's Pakistani!